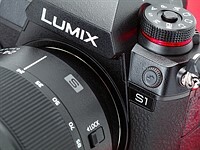 Now that our Panasonic Lumix S1R has final firmware, we're pressing ahead with our full review – but not before getting in some shooting time. Take a look at how the S1R deals with a variety of situations in our sample gallery, and we have to admit, we're kind of smitten with the out-of-camera JPEGs (there are some Raw conversions too, of course). Head to the end of the gallery to see some samples of the S1R's incredible 187MP multi-shot mode. You can also click below to check out our pre-production sample gallery from the launch event in Barcelona last month. I'd love to see a side-by-side comparison of a test camera with any commonly used one served as a control to get a better idea of IQ capabilities of each camera. Sometimes the location colors can be vibrant or dull, etc. Not perfect comparison but better than no control at all. I wish DPR would be consistent with how they display photos some edits come first and some come second in the pairings, also captions with details regarding technical info such as lens, length, f, ISO, camera mode (jpeg processor), and CRUCIALLY edited sections with specs of edits (e.g.. 35% sharpening and 40% clarity added). Image 28, was that depth of field alone or the familiar Panasonic miniature auto mode? I must say, some of the singular images look over sharpened, I doubt it is the camera achieving this, it must be an edited photo without the original to indicate as is usually done on this site. I would like to hear which is what etc. Continue to show Panasonic's advanced in color sciences. They're getting better, I would say they are only just behind Nikon and fujifilm, clear in front of Sony now and 3 miles ahead of Olympus. Over edited if you ask me. I see the pup is back. Pup was missing in some of the recent galleries. I can see this camera's SOOC jpegs are much better than the Q2 jpegs. I guess the Pany software people were too busy to assist Leica. Pups are always good subjects! And it's national puppy day today! Amazing. Just processed the RAW pixel shift file after running picture enhancement and ended up with a gigabit file!!! After some sharpening the file is absolutely gorgeous and you can print to ridiculous sizes. A landscape photographers dream camera. In some spots jagged edges can be seen in hi res mode. Is there any way to get rid of those? And what software did you use to process the RAW files? I converted the RAW file to DNG with Adobe DNG converter 11.2.1. I then opened in Photoshop ACR. That's what I then used the enhance detail feature (new on ACR) that pushed it from a 333MB file to over one gigabyte. I applied a bit of sharpening and the resultant image has to be seen to be believed. No jaggies either. Amazing. Pixel shift mode seems to yield pretty impressive results, maybe slightly soft at full resolution, but very good around half the resolution (90-100mp), which is still plenty. Blur suppression mode 2 produces some artefacts, which at first glance seem rather unobtrusive though. Not so sure about dynamic range and noise at normal resolution. Can´t wait for DPR to post the results in the still life comparison tool. Illuminating! Good gallery. Thank you Mr Rose. Impressive images, possibly the best FF images I've seen so far from any mirrorless camera, incl GFX. Nice work, if Panasonic can make a full range of lenses then maybe it can dominate this space, looks a lot better than the Z7. All the Lumix Ambassador's are all jumping ship to full frame after spouting off how good M4/3 is - it was sad to see at The Photography Show. Why is that sad? Things change. M4/3 is still good but this is better, which should be no surprise. The question for any consumer is where do you want to be on the spectrum? Whats sad is any of the Ambassador's could have moved to full frame ( nikon, canon ) but chose to stay with m4/3 spouting weight advantages and compact lenes. A full test would be nice. May I say the buyer should known what they want and what is needed. All the great photographer knew what they wanted out of camera. They wanted a camera that was extension of their creativity. 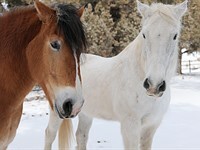 Get the camera you want and needed, not which camera has ### rating. This camera appears to work create fine images. Judge with an open mind. The samples don't reflect the intended purpose of this camera IMHO. I was expecting high-end fashion, product photography, exotic landscapes, low light events, fast actions. I understand DPR crew has limited time and resources to cover all these genre, but it would be nice to see at least an effort. All these street shots don't give the camera any justice. You wouldn't expect a race car test drive to be limited to just cruising at 40 mph, wouldn't you? I'd much rather see how a camera handles in real life situations. High contrast scenes, or similar challenging lighting situations. The only thing a fashion shoot would tell you is that a pro fashion photographer can take great pics with just about any modern camera. Ahhh. The eternal question: Do you use every ounce of your creativity, pushing cameras to their limits and producing wonderful images...even though many of your readers will abandon photography because they feel that they'll never be as good as you? Or do you play it safe, stifle your artistic instincts and produce relatively neutral shots knowing that readers will love you for not setting the bar too high? Seems like either way you lose. It isn't really possible to tell much at all by looking at images like this. I'll wait until I see the dpr studio scene, shot in RAW, at the full range of ISO settings. Then I'll use the comparison tool to see how the results compare with D850, a7Riii etc, before passing any judgement. Very nice pictures. I think promotional galleries like this should have commentary explaining to an amateur what about them could not have been produced just as well with a much smaller sensor such as an A7r3 or D850, or even a a6x00 series or D7200. Understood, and thanks for the feedback (though strictly speaking, it's not meant as a 'promotional' gallery - it's part of our full review process which is editorially independent from manufacturers and our parent company). I'll have a think about what we can do in future galleries, but I think also the forthcoming full review will answer some of these questions for you. The a7riii and D850 don't have smaller sensors; they are all full frame. I wouldn't be surprised if the sensors in those models actually turn out to be better than this, but IQ should be similar. Not really sure why anyone would blow this much money on a this camera when there are already better options for a lot less money. xPhoenix - I can think of 2 very good reasons. The a7Riii is a fine camera but the ergonomics are sh*t.
The D850 is a fine camera but it's a DSLR. What many people are looking for is a high quality professional FF mirrorless with good ergonomics, state-of-art optics and sports-able AF. The Panasonic potentially could fulfil all those requirements. I wouldn't say the a7riii's ergos are terrible, but overall it's just too small for my hands. I could probably live with it rather than paying the premium for one of these. I guess my biggest complaint about ML (not just this new Pany), is they have nothing to offer me, so I have no reason to drop my DSLR. Anyway, that's just me. Just saying, if Nikon is having trouble selling their Z cameras that cost a lot less, than good luck to Pany. xPhoenix - Yes I was exaggerating when I said the a7Riii ergonomics are sh*t. The positioning of the controls is fine (and I don't have any issues with Sony menus). What I dislike about Sony ergos is that in my hands they just don't feel comfortable - I find the controls to be cramped, and imprecise compared to my DSLRs, and I feel my fingers pinched between the grip and the lens. Some of the issues can be minimised by using a third-party base plate or a battery grip, but at the end of the day, I feel that Sony need to go back to the drawing board and redesign their cameras with the aid of good ergonomics experts. I like the Panasonic,but it's just a bit *too* big and heavy for me. The ergonomics look good. I'll reserve judgement on the AF until I've had a chance to handle one. Either way, I'm unlikely to buy one, as I'm tied to Canon lenses and flashguns, so I'll probably wait (maybe forever) for Canon to wake up and release a pro-quality FF mirrorless. Yeah, I agree on that. I did try out an a7riii when I was trying to lose some of the DSLR bulk and weight, but it didn't feel great in my hand, unfortunately. At this point in time, it'd take a heck of a lot for me to switch from Nikon to another brand. I've got some decent lenses, and really don't want to start over. I don't even like Nikon's own ML offering. I shoot a lot of wildlife, and it seems like most of these new ML cameras aren't geared towards that area. xPhoenix - Looking at your gearlist, and given the fact that you photograph a lot of wildlife (me too), I honestly think you'd have to be completely daft to consider switching from the gear you already own. I'm a Canon user, but honestly, the Nikon D850 is quite simply the best FF camera (either MILC or DSLR) in existence. I don't see Panasonic being able to challenge it for at least 4 or 5 years, as nothing can match the D850 for AF, and Panasonic simply don't have the glass. We can certainly add it to the list, thanks for your feedback! and then compare to the pentax k1 and k1 ii. Because I am in the market for a camera, not a mirrorless camera or DSLR. Just a full frame weather sealed camera. PIxel shift is one option that only a few have. Please dont separate them based on mirror category. @ ewelch put the Panny R with the 50mm f1.4 and 24-105mm and then you're welcome to the Leica camp. The high resolution photos are impressive, in that some of the issues of earlier iterations of the idea are getting sorted. Cars, people moving and even an airliner flying overhead look quite natural. Waves and a bobbing boat are less natural but still not terrible. An impressive feat, though it's hard to see where I would ever use the ability, personally. May be fun at times just to pixel-peep complex scenes though? ISO 100 and F11 !!!! All images that are in this ballpark are fantastic. That is where you shall use it. The rest are quite ordinary IMHO. F8 and ISO 200 are, of course, also very good. But, it degrades if you move away from that. At ISO 6400, it is rather horrible. I am not so impressed that I thought I should be. Maybe it's dull light season around Seattle, but colors are just very unbalanced. Kind of brownish in general, but the red Mini and the blue jeans stand out somehow. Will be interesting to see some summertime pictures with this cam. What software can open the 186mp RW2 files ? That $3700 price point is pretty cocky considering these images look just like any other FF camera. Should they look better because the camera costs more? That's an interesting straw man. Uh, for that much money, yeah, they should look better than a camera you can buy for $1000. Want one? Buy one. However, I suspect many people won't. These "new" cameras that really bring nothing new to the table are getting out of hand. $1000? I'm sure you can take these pictures with a camera that costs much less than $1000. But changing your perspective on the world is not worth my time. You apparently value image quality above all else so, you're right, this is a pointless camera for you. Any FF camera will take pictures as good as these, and for much less money. Camera sales are declining like crazy, and Pany comes out with a $3700 ML model that doesn't do anything better than the rest of the pack. Oh well, it's their funeral. I think it differentiates itself well. The Nikon D5 and 1Dx say hold my beer. At that price, if it does not differentiate itself enough for pros, it will be the "straw man" the broke the camels back. Doesn’t the 5DIV go for that price or around that price in the USA? It started in or around that price in japan and has sold damn well, its price adapting to market demand, and nothing broke the camel. I’m considering selling a GFX for the S1R as I need operational speed in the work I do and am not interested in waiting for a doubly expensive 100MP version. @shigzeo - My point is, why would a pro change to a Panasonic if it does not have large differences from what he/she is now using? In some cases that still does not make a difference. I just attended a wedding where a pro was using a Nikon D300 and single old Nikon zoom to shoot the whole wedding. You are considering changing formats, which is a huge difference. I think that you would be sacrificing IQ for operational speed, but it sounds like that is an acceptable tradeoff to you. I do not think the new 100MP GFX is going to be anything close to as fast as a S1R. I moved down from larger format medium format backs to the GFX for operational speed. There was a small penalty in image quality, but one I was happy to make to speed up the most basic of all movements I needed. But the GFX is really slow even compared to a D80 for macro and the S1 is speedier. The image quality difference between FF and GFX is minor, especially in macro when using the same lenses. But I came from the MF world and wanted to somewhat stay there. The S1R appears to be a good compromise for one like me that wants to keep a mirrorless for adapting to various lenses and mounts, of course not as well as a real back, and because of the large flange distance and subsequent shading, precludes the use of serious shifts. People moved to Sony, from Nikon to Canon and vice versa. Some keep their gear for a long time, others do not. Pros span the gamut. Indeed, if fuji built a camera as well as the SL, and worked on their UI design to work as nicely, their cameras would be at least twice as expensive. If they built and ordered as few cameras, they would have to add another 1000$ per camera. The idea that price is too expensive fails to take into so many factors. I guess I am just puzzled as to who's really going to be buying all these new, crazy-expensive ML cameras. I don't think it's going to be the pros, and most everyone else is just using their cell phones. I know some enthusiasts are interested, but that's a pretty small market. I splurged when I bought my D850, and frankly, I see no reason to buy anything else for the foreseeable future. I don't disagree. I'm using an 80D, which is better and faster at focusing than the X-H1 and SL. It's not as well built as either, but has easier controls and super easy to understand menu system compared to the X-H1. The thing is that certain jobs are easier and faster with a mirrorless. I shoot macro and still life for a living. Having a camera or digital back which doesn't need to go mirror up is great. Having a relatively low-angle flange distance means I can adapt as wide as 55mm medium format flangeless lenses and still have room for a little movement. That doesn't work with dSLRs, which overall I prefer. For me, ditching the GFX (If I do so) will free a few dollars. Professionals hang onto cameras probably longer, but sometimes they adapt to new systems. @shigxeo - I do not concentrate on macro, but if I did, I would be leaning towards an 80D or Canon R with Canon non-IS 180mm/f3.5. My second lens choices would be either the Canon 100mm IS macro or the Sigma 105mm macro. The Sigma was the top rated macro lens in a test of 8 macro lenses by the British magazine Practical Photography. The Canon 180mm is a proven design over many years. George Lepp has been a pro for 50 years and writes for Outdoor Photographer He uses Canon equipment and invented the double flash bracket for macro. He says most bad macro is done with bad technique and not equipment. Good luck! I shoot both quasi macro in the 1:2 range and extreme macro of around 20:1. There is no barrel helicoid lens from anyone that can do that. You have to use tubes or bellows. I use the latter. A canon. 35/2,8 photo macro does the trick in a lens stack or Super extended on 600mm of extension. Better yet, microscope objectives stacked on APO lenses. What's the point? Since D3X any camera can do similar pictures. I like the pixel shift photographs. This camera looks like it could be good for research purposes, and more specifically tethered shooting. However, I wonder if it will be usable. The G9 has a bad tether program that has many bugs and does not let you use the camera to its full potential. My main grievances are that the tether liveview feed is of such a low quality that it does not let you see whether an image is sharp, and turning on hires mode cannot be done through the PC: you need to manually turn it on via the camera. When doing the review of this camera, dpreview might like to look into the usability of the tether feature. G9 doesn't sync flash with pixel shift -- big disadvantage. I wonder if the S1R does? I forgot about that. Indeed the lack of flash synch for pixel shift is a bummer. Another issue is that after taking a shot in tether mode the G9 reverts certain settings like SS and aperture preview. This means that with every shot you need to turn it back on again. It is too labor intensive and could be fixed with a firmware update. However, Panasonic does not seem to be concerned with the tether functionality. This is a real pity because the G9 would otherwise be a great scientific instrument. I have reverted to using my Eos 600d because the G9 was such a nightmare to work with. I am shocked with everyone here complaining about pixel shift. Just use a k1 if you want this seamless feature. It does it for you and the file is the same size. Pentax was first in this game and have all the patents. They have had ibis since like 2006. @gravis92 -- Does the Pentax K-1 sync flash with pixel shift, like Olympus does with preset delay between captures to allow for recycling? @paleodawg was complaining about G9 tethering limitations, particularly with live view. How well does the K-1 perform in that function? @gravis92 -- As it turns out, K-1 is deficient on both counts -- no flash sync w/ pixel shift, slow USB 2 tethering but no USB 3 -- so please stop trying to promote Pentax. People can make up their own minds about brands/models based on whether the features meet their needs, and you may not know what those needs are. Pretty good. I shoot Nikon mainly but like Panasonic output, which is why I still have a G1. Typically the default jpeg output is a tad under-saturated but easily corrected. They need to be compared against the single-shot frames upresed with a state of the art algorithm to same resolution for the comparison to make sense, hope DPR will do so for the studio comparison scene. They need to be compared objectively. A wedding cake standing by itself looks good almost anywhere, but put in a room with other wedding cakes and the choice becomes more difficult. I never liked Panasonic colors, especially yellow, despite my attempts at many different settings. Yellows that my eyes were seeing were far from what the camera was giving me. After 3 Pana cameras, with very similar results, no more Panas for me. For these images, I don't know if they are worth shelling $6,000 (plus) for them. For me, they are not. Well, if you intend shooting JPEG on a $6,000 camera, then you maybe shouldn't. I don't get people complaining about the color on a given camera. Shoot RAW and move on. You can make it anyway you want. Plus, every modern camera allows you to tweak the in-camera JPEG engine - some more than others but you have a lot of control over the output. To a limit, phil. I'm not newby to photography. Well, sorry, but you are talking like one. If camera X produces an image that needs nothing aside from perhaps a little crop, or just a notch up in brightness, and camera Pana produces colors that're not close to the actual colors of the image, and the image needs 10 minutes of playing with its raw file, then I prefer to use camera X. Now if I have 400 to 600 images to process, then you can get an idea about the time needed for these images. I shoot RAW + jpg 100% of the time. You're talking like you process one image per week. Sorry. Seems like everyone drank vinegar this morning at breakfast, so I figure I have to write something good: nice gallery of photo's which shows what the camera is capable of (and probably a lot more.) While I never was a big fan of Panasonic colours, these samples prove that it has stepped up: nice colours with a touch of saturation, but not overcooked. I really like it! I agree about the nice set of samples. I find the JPEGs much too contrasty, but most of the processed Raws look very good to me. Most pics will be seen at poor quality monitors via the web.Most dpreview visitors will see pictures at noncalibrated phones or cheap laptops. Very few pictures, thousands of ‰ will be seen at showroom walls. Again - as usual I am astonished by the amount of pixels and data that is seen as an important part of photography. It is not. Industry is so saturated with/of cameras that factories/brands have to find out something new to boost sales that go down. That something is photography and visuals..areas which have been forgotten during this useless race of the amount of data. Nowadays the industry is about the binaries and nice buttons. The main things are forgotten totally. Difference. Visuals. Ideas. Ergonomics. Multiculture. Free thinking. Real knowhow. Reading novels. Drawing. We are throat deep in plagiarizing other people`s pictures and brands have no other way to sell more, than boost the size of files the cams produce. C'est une cul-de-sac, et nous y sommes déjà. Okay sure... And what exactly does that rant have to do with the Panasonic S1R? Do you "String" think that it is polite to call my personal opinion as a RANT? I am brave enough to use my name when writing, why aren`t You? Web is full of little hate or large hate. Why could You just tell what You think about my opinion and leave insults off.? Haha, why are you so offended at him calling your comment a rant? A more accurate term would have been diatribe I think. Regardless, I still agree with the point of his comment - that your generic rambling complaint about the state of the photography industry had zero relevance to the post. And your follow-up complaint is laughable in it's lack of self awareness. You complain that he insulted you instead of commenting on your opinions. . . all the while insulting his username and calling him a coward instead of responding to his stated opinion that your comment was irrelevant to the topic. Okay sure... And what exactly does "your personal opinion" (as stated) have to do with the Panasonic S1R? If You really cannot connect my "rant" with S1R, then there`s no use to explain. cause you don`t need an explanation, You wanna have a win here. That is how the internet has changed us as human beings, all the hate has turned us to something that spoils the world. At least 11 persons did understand what I wrote, You did not. Hm..
As a professional I see cameras a bit different way. From now on I will not comment anybody who does not use his own name. I´m tired of anonymous shouting from the bushes. As consumers we have been spoiled with limitless options that water down and automate the points you have touched on. All at more cost. He politely apologized for the insult and explained it wasn't intended that way. And you still can read his mind and rudely explain he is just looking to "win"? Your original comment has some upvotes but don't ignore the fact that his has roughly twice as many, so he is obviously not alone in wondering what your comment had to do with the topic. Those 11+ people that upvoted your comment might have agreed with your sentiment but it would be folly to assume that they share your opinion that it was related to the topic. Maybe they did, maybe they didn't. You don't know. The only possible thing that can be interpreted as having ANYTHING to do with the S1/SR1 are that they make large files. They have a high MP and low MP model for this first generation so if that was your complaint it would be the stupidest one I've seen about these models. Especially due to the fact that the file size itself doesn't prevent anyone from being free and creative in their visuals. A good sampling of images. JPG colors are underwhelming but that's the way it is with most cameras. If you want great colors...shoot RAW or take the time to tweak the settings to the JPG engine to get the colors you want. Otherwise, looks like a winner. Typical Panasonic style, sharp images with muddy colors. I find the colours very natural and realistics, but that's me. I agree that hires photography is required f.ex. in industrial or science applications, but those shots could have been made with any good modern 1" compact camera. Not with a 1", but with any current FF camera ame good glass? I bet. However I am sure that electronic viewfinder must be a pleasure to use. It seems many people have forgotten the other-than-visual aspects of a camera. You can't tell by looking at set of pictures what the ratio of keepers is, how fast and accurate the focusing is, ergonomics, etc. These things also add value to a camera, thereby affecting it's price. I think the Panasonic Lumix S1R is quite a camera, the kind I could use for many years and remain very happy with. 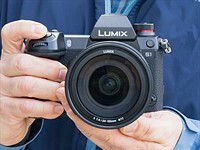 I'm a fan of Panasonic but if It follow Leica's price it will have problems. 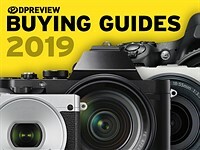 Why buy Panasonic at the same price or a little less than the price of Leica.what the point. Are you paying attention? When were Leica prices even close to that low? The 80s. Can you send me the link to where I can buy a Leica FF for those prices? I can't wait to get hold of one. Why buy either brand? I see no reasons, unless you've got money to burn. Normally, a person pays those kind of prices for status, but Panasonic has no status value as a brand. Pay a little more and buy Leica status and receive great optics as a fringe benefit. Maybe amongst amateurs it has no status. We've had a little more time to shoot around with Panasonic's high-resolution full-framer and thus, top off our sample gallery. We've also had the chance to add a whole lot of Raw conversions. Panasonic has released full details of its two pro-oriented full-frame mirrorless cameras. 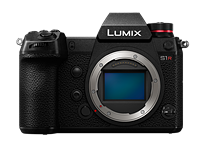 The Lumix S1R, aimed purely at stills shooters, will debut in April with built-in 5-axis IS, a 187MP multi-shot high resolution mode and 6 fps burst shooting with AFC.